THE Brighton Colts are the 2009 grand final winners. The Colts defeated the favoured New Norfolk team convincingly by 48 points. Going into the match everyone knew it was going to be a great game. New Norfolk had beaten the young Brighton side in both encounters during the home and away season quite comfortably so it was a huge surprise when the Brighton boys beat New Norfolk in the qualifying final, which was New Norfolk’s first defeat for the season. What a fantastic footy season it’s been for Brighton’s Tim Boucher. To cap off a great season at club level, Tim took the honors at the League’s William Leitch Medal count night to win the George Watt Medal for the reserves best and fairest. Brighton Council passed on the full savings of the transfer of water and sewerage services to the new State Government established authority, to ratepayers this year. Brighton Mayor Tony Foster said Council had deducted the entire cost of its provision of water and sewerage services and due to its own sound financial management, the average rate increase in the municipality for 2009/10 was just 2.5 percent. EVER wanted to run away and joint the circus? If the huge crowds who turned up for Brighton’s Circus Festival are anything to go by – it looks like a few locals have had this dream. About 400 people came along to learn circus tricks, meet the crazy clown and some brave children even showed off their new tricks in the circus show. Circus performers, Hamish and Amelia show what circus performing is all about. Dynamic acrobatic brother and sister duo performed to an entranced audience. Hamish and Amelia Anderson made it to the semi-finals of the hit television show Australia’s Got Talent. Their fabulous tricks and unique costumes wowed the notoriously hard to please judge, Red Symonds who invited the duo back for an exciting encore performance on the shows last night. WOODCHOPPING is returning to the Brighton show on November 8. After last year’s absence, organisers say they are looking forward to seeing the ‘chips fly’at the new site on the dog arena, right next to the new animal nursery. Mums and dads will be able to keep an eye on the children at the nursery while watching the chopping. BRIGHTON’S popular market on the first Sunday of every month recently celebrated its first birthday. Brighton Council’s deputy mayor Geoff Taylor cut a celebratory cake and congratulated the market organisers for the great concept. WOMEN’S health has long been a major priority of the Brighton Council, so much so that this month sees the inaugural Women’s Health Festival at the Brighton Civic Centre. 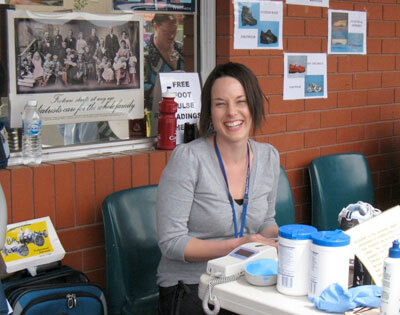 Community podiatrist, Fairlie Collins at least year’s community health expo and who is looking forward to this year’s women’s health event. Community health social worker and coordinator of the Women’s Health Festival, Robyn Bishop said one of the key aims of the festival was to increase women’s knowledge of the myriad of services and support available in the district. LOCAL Brighton businesses are being urged to ‘fill the void’ left by the loss of funding for the existing YouthLinx program, which ceases in January next year. The Department of Employment, Education and Workplace Relations, (DEEWR) provided approximately $81,000 a year to Bridgewater PCYC to provide services for ‘at risk’ youth and their families as well a family liaison role where youth and their families receive support, information, referrals . When this funding ceases next year, it will be difficult for Bridgewater PCYC to offer any meaningful youth programs catering to the most ‘at risk’ in the community.